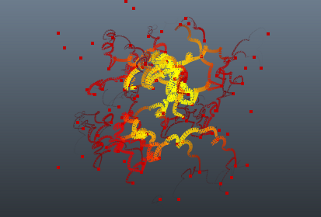 The main application of this node is to interpolate nCache data over time (particles, fluids, mesh geometry), but it is not limited to just that. It can be used on any array, or dynamic arrays structure. 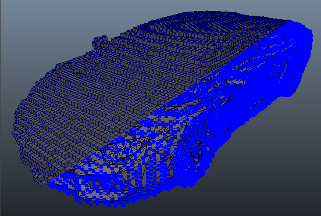 Maya's nCache can interpolate pretty well fluids cache with consistent voxel count over time. This example and the related to it scene, showcase how any array data can be time-interpolated. In this case the arrays are read from the nCache node, but they can come from anywhere. 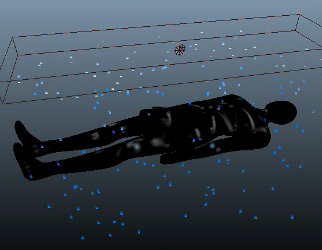 On the left side is the original fluid animation (40 frames). On the right side is the nCacheInterpolator time-scaling it 200% - effectively blending the density, velocity, etc. arrays. Our community forums contain many interesting threads that are not always easy to discover, so we will start bringing some of them to the spotlight here. 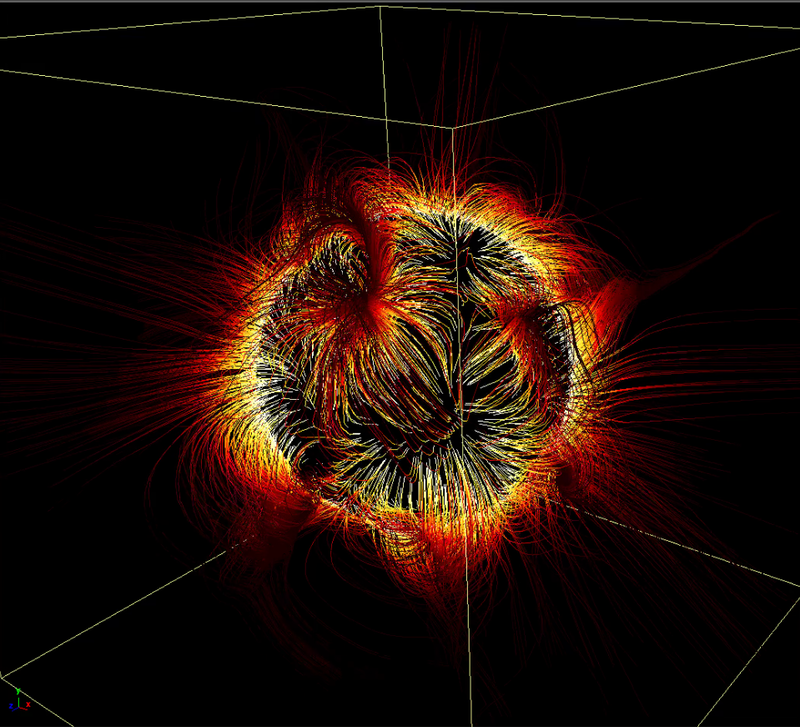 This one in particular is about magnetic fields. The showcased solution utilizes SOuP and OVDB to achieve the desired result. Turned out pretty good. The setup leaves a lot of room for experimentation - shape, color, noise, motion frequency, etc. There is a related scene in the examples archive. Intelligent mesh generator rebuilds missing components to mend holes in geometry. The new mesh patch conforms as closely as possible to the original subdivisions and can be further smoothed to produce seamless results. A powerful toolkit that allows artists to quickly build very complex models using simple input shapes. 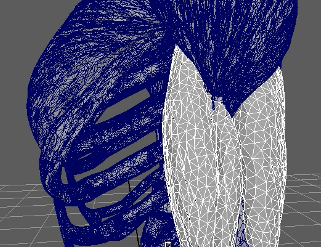 A new HardMesh boolean is created from two mesh objects. There are multiple boolean operations to choose from: Union, Difference A-B, Difference B-A, Intersection, Panel A-B, Panel B-A. 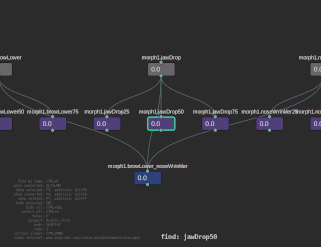 A live procedural graph allows us to modify the input shapes at any point later and get the changes instantly propagated to the final blended boolean. 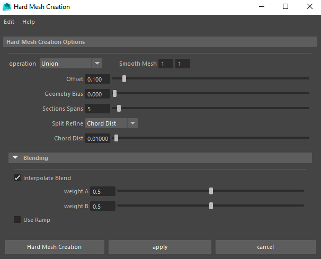 The main GUI provides a convenient access to everything needed for working with the HardMesh system. Existing booleans are represented as a stack of operators and can be edited at any point after their creation. Intuitive and efficient workflow is designed around a selection sensitive interface which displays the related stack of operators and related options whenever input shape of a boolean is selected in the scene. 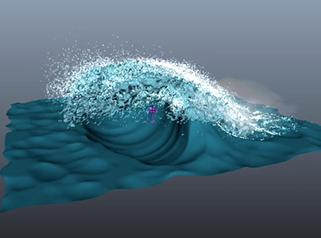 The upresFluid node resolves some major issues in the fluids workflow of Maya by separating dynamics and resolution from the visible detail, and by implementing of wavelet turbulence algorithm (based on Theodore Kim and Nils Thuerey's open source library) for additional details as a post process. 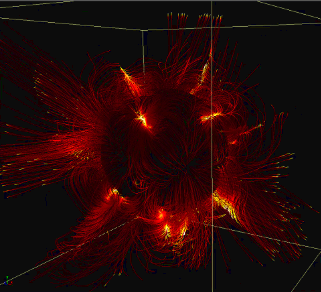 Fluid dynamic simulation strictly depends on the container resolution. If we change the resolution the fluid will behave differently. This is not good in production because as we design our fluid, we want to use low resolutions for fast turnarounds while working out the dynamics. But later, when we have figured out the dynamic aspect and start tweaking the look of the fluid, we often want to increase the resolution to get more detail (or the opposite) and often have to start again, tweaking the simulation to accomodate for the new resolution. The upresFluid node effectively eliminates the dependency between resolution/simulation and shading/look. For this purpose we use two containers. In the first one we focus on the fluid motion. There we can keep changing the fluid resolution in order to to achieve the best motion, without worrying about the shading part. Once we are happy with that we focus on the second container used as a static display driver for shading and rendering purposes. The best part of all this is the comes from the ability to change the resolution of the display container on the fly - at any point. It will inherit the basic data from the source container and will interpolate it to fit its own resolution set by the upresFluid node. 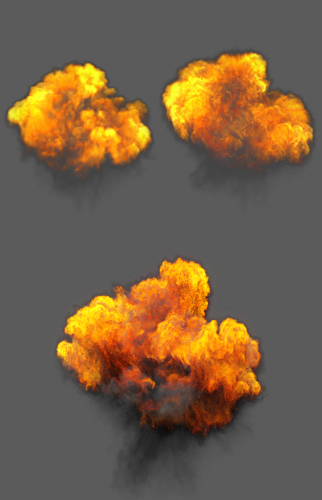 As a finale we can turn on the wavelet turbulence feature to add plenty of additional detail that is impossible or at least extremely hard to achieve otherwise. * The current version does not fully support auto-resizing of fluids. Tracks which faces of one mesh object are inside another object. Cage node builds a list of faces from the tree crown that are outside the moving rabbit. The list is then piped into a deleteComponent node for procedural deletion. 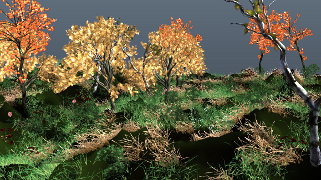 As a result the leaves outside the ribbit object are deleted. A procedural 3D texture node generating voronoi patterns. Transfers the shape of one object relatively to another based while trying to preserve as much as possible the original shape, relative to the form of the target object. There are multiple built-in methods that solve many general and specific cases. 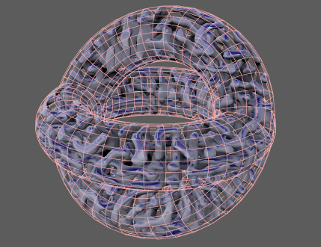 The node can be used as a standard or "relative" wrap deformer, uvBlendShaper, or mixture of both. 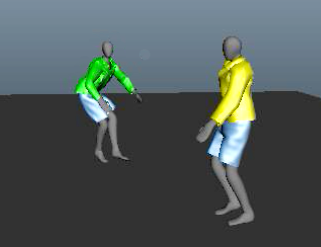 On the example video the yellow shirt and blue pants on the walking character are cloth sim. 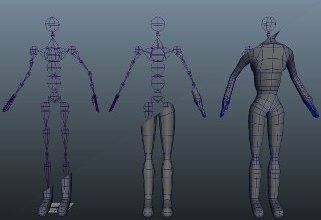 The green shirt and blue pants on the dancingmodel are basically the same cloth motion but relativelly transfered to accommodate for the different body motion. 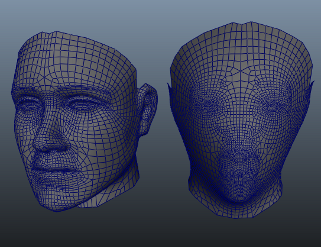 The retarget node can be used for transferring of facial blend targets between two heads with different topology and proportions, while preserving the sculpted details. 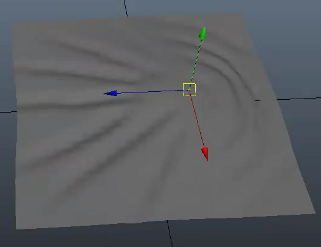 Smooths mesh objects using Laplacian algorithm. Provided are options for boundary and volume preservation. SmoothSimple is a derivative of the smooth deformer that trades some of computationally expensive features for extra speed. 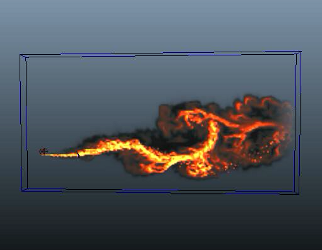 Maya PaintFX is very powerful L-System but lacks the ability to instance custom geometry to its elements. 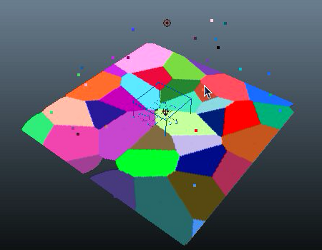 To fill the gap we can use pfxToArray node to extract the paintFX data for further modification and custom usage. In the first video we selectively read subsets of points. In the second video, we pipe the extracted data into geometry instancer using arrayToDynamicArray nodes. 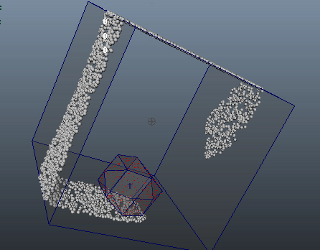 The rayProject node projects points (particles, vertices, CVs, etc) onto mesh objects. There are multiple options for precise control over what gets projected, where and how. A subset of the effects that can be produced with this node are also known as shrink-wrapping. 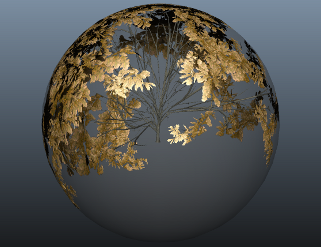 A PaintFX tree gets projected onto a mesh sphere. The rayProject node can easily create permanent deformations in addition to the standard behavior that does not have notion of "history". 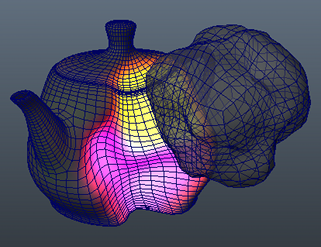 In addition a point node applies vertex colors to the teapot based on the amount of deformation and surface orientation. Two more examples for the curious. Morph is fast, multithreaded and memory efficient blend shape deformer that can handle thousands of targets with ease and without degrading performance. It can be used for pre-deformation blend shapes and post-deformation corrective shapes. 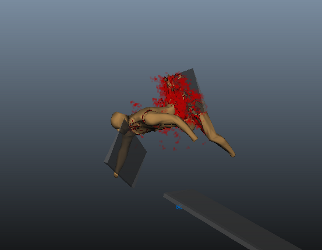 Shot-modeling is important part of every project that involves character animation. For complex character shows, it often becomes one of the most important pivots in production. This GUI and the underlying API are designed to simplify and streamline the shot-modeling workflow from both artistic and pipeline standpoints. A whole new approach to working with blend shapes. This is a comprehensive toolset that can handle huge amount of blend shapes with ease. 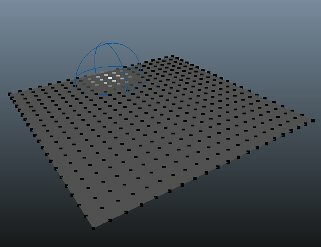 Generate points on the surface and/or inside a deforming mesh object. 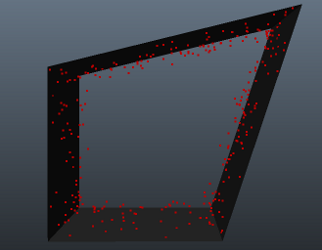 Scattered points on the surface and inside a mesh object. Masked areas. 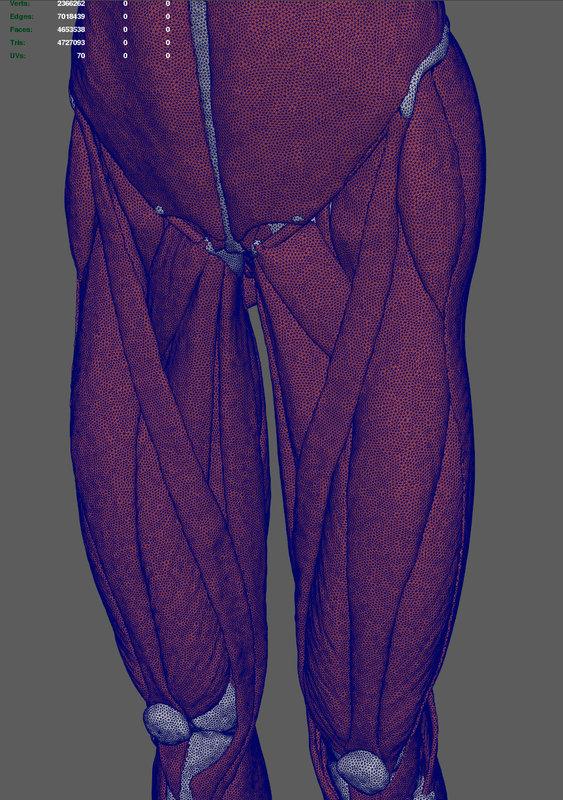 Weight maps can be painted or generated procedurally by other SOuP nodes. Generate points within a distance from the geometry surface. Emit fluid from the scattered points. Alter the emission properties using attributeTransfer and bounding objects. 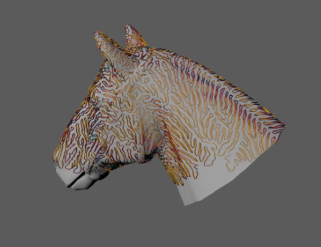 Using texture based distribution we can precisely shape the scattered points in many different ways, including "boolean" operations from multiple projection planes, textures and UV Sets. As you may know already the scatter node can be used to directly drive particles, geometry instancers and procedural shatter nodes. With the texture based distribution we gain complete control over the scattered points and in this way over the mentioned above systems. 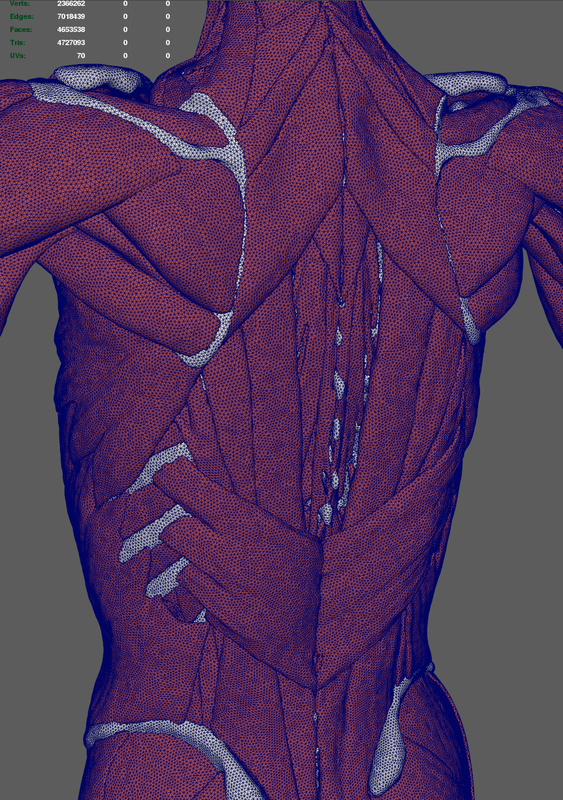 Boolean + texture masking (two checker textures). 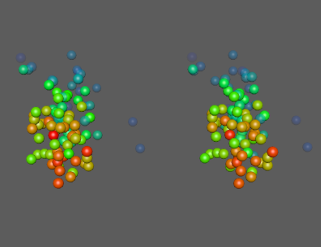 Basic example showing instancing of "sprites" to scattered point cloud on the surface (left) and inside an object (right). 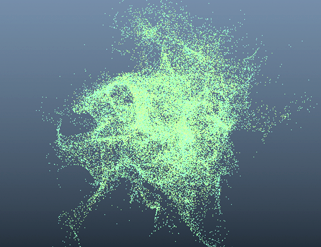 Scatter nodes can be used to drive particles in a procedural manner. This way you don't have to rely on dynamic simulation which is very useful in many cases. The scatter node has inPositionPP attribute that can be used to supply custom point cloud to it and in this way to bypass the generation of randomly placed points internally. Many interesting effects can be achieved by supplying vertices, particles, voxel or pfx data to the scatter node for post-processing - for example - uniform filling of objects (as shown here). The associated distance to surface data for each point controls the color of the emitted fluid. Yellow to the center of the spiral and dark towards its edges. 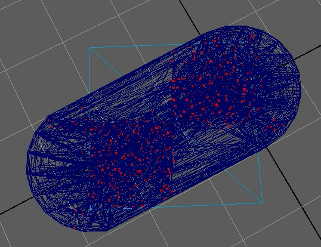 Fill any mesh object with uniformly generated grid of points by using a combination of SOuP nodes, inluding a scatter one. 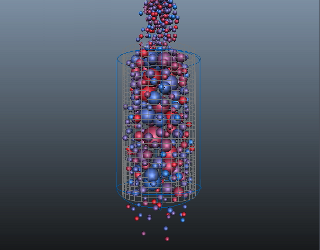 This structure is then used to emit into a fluid container. 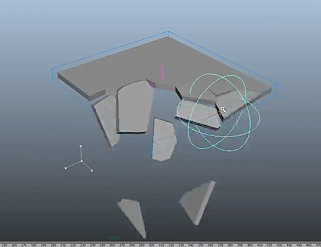 Breaks static/deforming mesh objects on solid or surface shards. 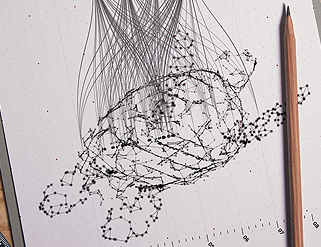 The node relies on input point cloud generated by scatter node, particles or nurbs curve. 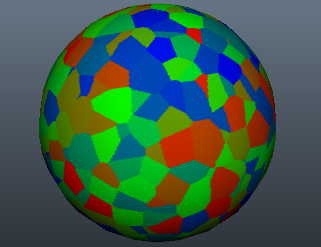 Voronoi cells get calculated and geometry is cut on the boundaries. 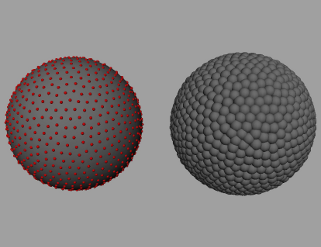 Multiple parameters are animated over time - number of points, distance between shards, geometry resolution of the sphere. 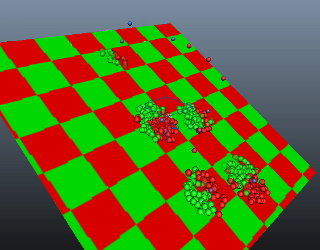 AttributeTransfer and bounding object nodes influence the positions of the scattered points. 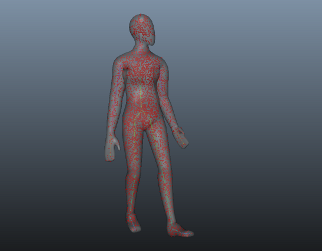 The red points represent the original point cloud, the blue ones are the post modified one. Shattering of deforming geometry. 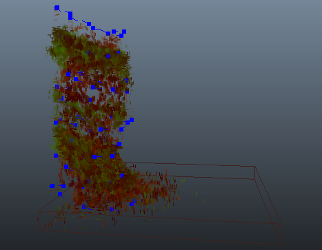 Notice how the shards stick to their relative positions by caching the input point cloud coming from the scatter node. Look for the "bake" button inside the node's AE. A more complex example involing shattering of deforming mesh geometry, rigid body simulation and procedural control over dynamic constraints. Scatter points inside a box. Shatter the box accordingly. Turn the shards into nMesh. Apply nConstraint to hold them together. Use attributeTransfer and bounding object to control the constraint's per-point weights. Split the data flow in two separate streams and combine them at the end. 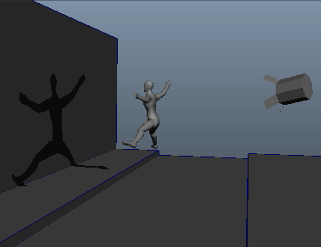 First stream is used to remove all ground faces that do not interact with the dancing character. 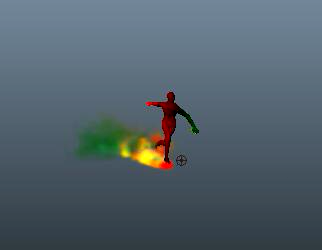 The second stream is used to generate scatter mask (point colors) so we get points only where the character touches the ground. 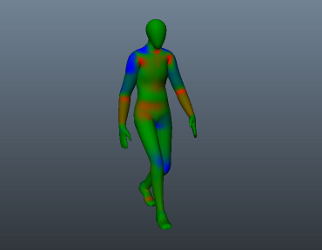 Plug the scattered point cloud and the remaining faces into a shatter node to get the desired result. Calculates point velocities of topologically consistent (over time) geometry. 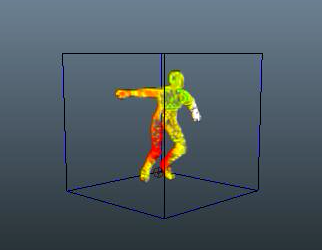 ComputeVelocity calculates point velocities of the dancing character and stores them in array. 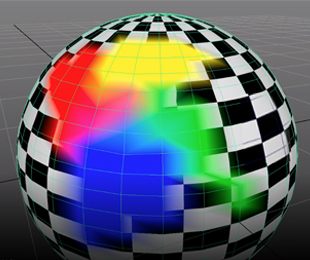 ArrayToPointColor converts this array to point colors. 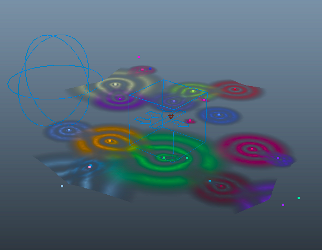 AttributeTransfer transfers colors from character to ground plane (hidden here) based on proximity between their points. PointCloudFluidEmitter emits fluid properties only from the area where character contacts the ground, and the fluid is colored accordingly. ComputeVelocity calculates the velocity vectors of each point of the geometry before it gets modified (the original moving teapot). AttributeTransfer node transfers these values to the final geometry, so even the point count changes over time we still get consistent motion vectors. Using the remapArray node we post-modify the velocity data. 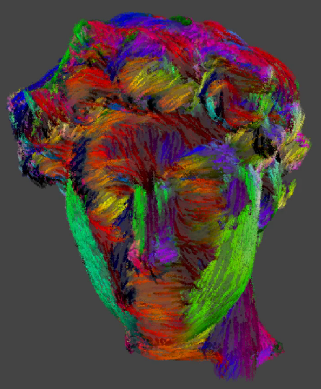 The velocity vector array gets converted to a set of pointColors by the arrayToPointColors node and in this particular case it is named "velocity". Finally the modified teapot mesh's attribute "motionVectorColorSet" points to that "velocity" colorSet and passes it directly to the render. 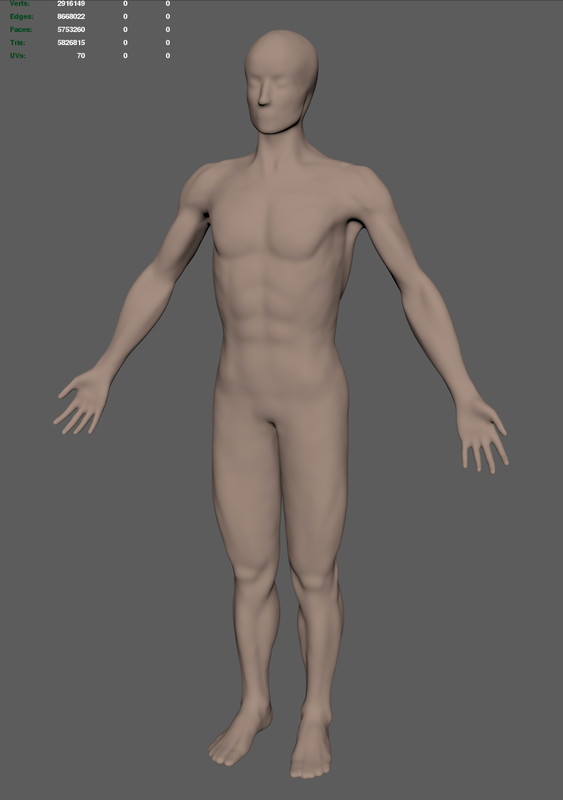 Generates lists of components (points, edges, faces, uvs, etc) based on different rules. 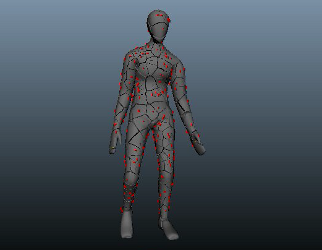 The created data can limit the scope of work for other nodes like deformers, modifiers, etc. 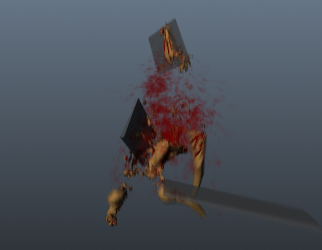 How to render changing point count geometry with proper motion blur? Easy. 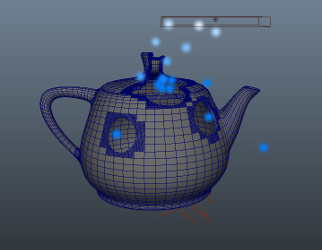 In this example we have particles falling over moving teapot. 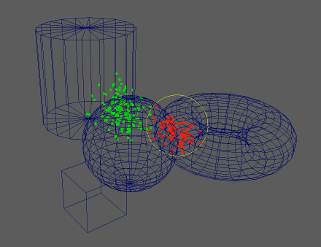 BoundingObject is passing the particle positions and radiuses to group node. 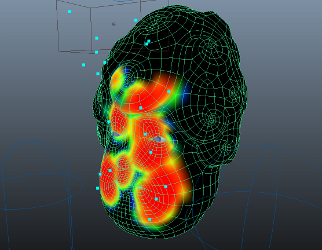 The group node collects the face ids around the contact points where particles collide with the teapot surface. 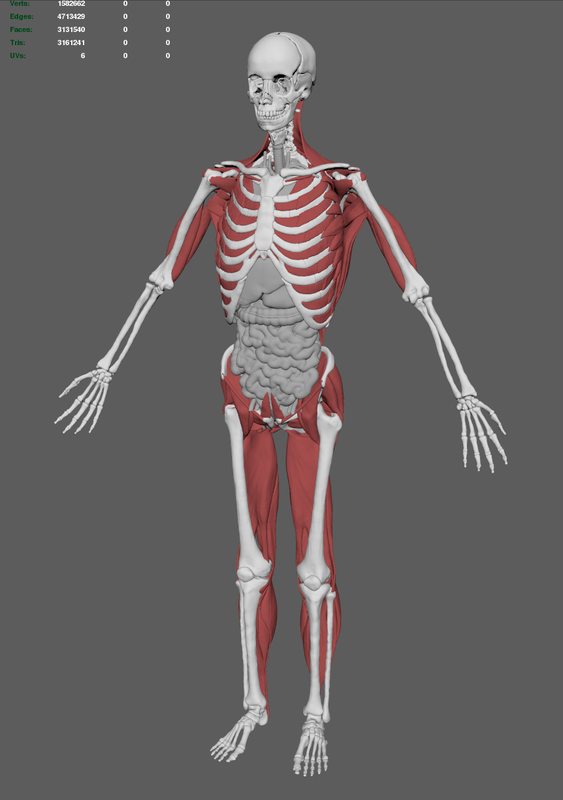 This componentsList gets passed to polySmoothMesh and deleteComponent nodes. The polySmoothMesh subdivides the faces to get more resolution, so when the deleteComponent node does its thing we get round holes. 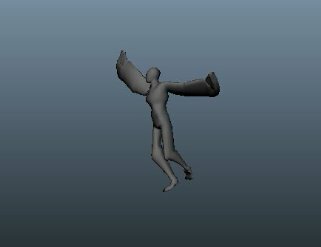 How to render changing point count geometry with proper motion blur? Part 2. This is a more involving version of the example above. 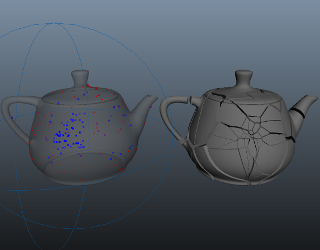 In addition to everything from the teapot setup, here we have group nodes that collect the boundary faces of the tearing surfaces. They pass the inverted componentsLists to deleteComponent nodes that are plugged to separate meshShapes - so we always get the boundary faces no matter what is happening to the upstream geometry. Then we emit particles from these faces. This way we get blood particles only where and when the geometry gets torn. Using this simple approach we can eliminate a lot of tedious work by hand needed to ensure proper particle emission from the right place and at the right time. Notice how even the point count and order changes over time, we still get everything properly motion blurred. 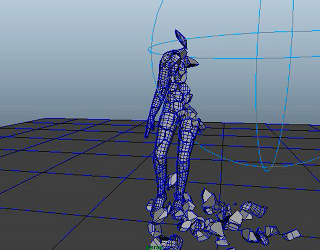 Component texture attachments in Maya are based on object groups. Using the group node we can control interactivelly that otherwise implicit system. In this example we have a ramp texture with cranked up noise attribute assigned to couple of objects. There is a character walking around them that has a different texture assigned. Based on proximity we "transfer" the ramp texture from different objects to the character geometry. The interactive caching system (ICS) is designed to improve perofrmance by minimizing unnecessary computations when working with deforming geometry with consistent point count over time. Once applied to deforming objects it automatically begins to operate by tracking input conditions and caching internally geometry data for each frame we step on without any further intervention by the user which results in a fluid workflow. If the input conditions don't change when we step later on the same frames dependency graph evaluation is bypassed and the internally cached data is used instead. This node works in conjunction with other SOuP operators like group, attributeTransfer, multiAttributeTransfer, morph, etc. It provides spatial information about geometry components needed for many operations. BoundingObject reads particles positionPP, rgbPP, radiusPP and feeds group and attributeTransfer nodes with them. The Group node has an option to store componentsList and objectGroup data for previous and current states (by default it considers only the current state). 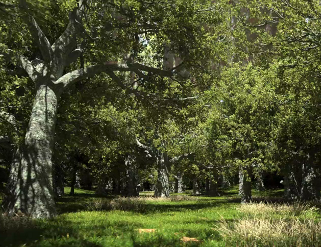 This data gets passed to deleteComponent node that deletes faces from the leaves geometry. 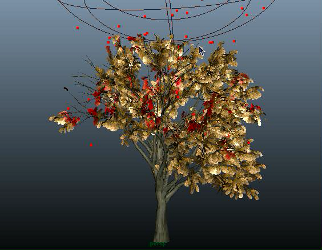 AttributeTransfer node slightly attracts the leaves around each particle and recolors them (in red - all particles in this example are red). As result we get an "acid rain" effect. Mind, there is no transparency hack or anything like that. It is all procedural geometry manipulation. Procedurally delete geometry. Group node collects the face ids inside the bounding object and passes them to deleteComponents node. 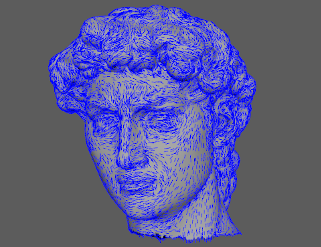 BoundingObject in pointCloud mode reads particle positionPP and rgbPP attributes. AttributeTransfer node transfers them to the ground surface. Alpha channel is modulated by "alpha" ramp attribute located on the boundingObject node - that's how we get multiple circles around each particle. 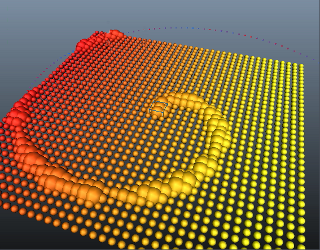 Transfering of point positions produces the "swimming" effect - each particle attracts ground points around itself. 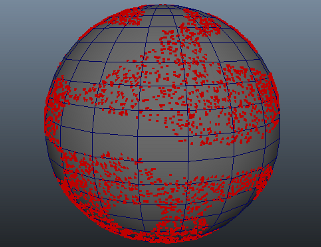 Accesses and manipulates points (particles, vertices, CVs, etc) using standard MEL expressions. Point node randomizes grid points in the XZ plane and assigns to them random colors. AttributeTransfer node transfers the colors to another plane. 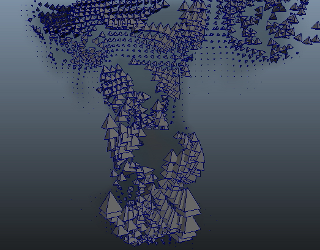 The result is a Voronoi noise. 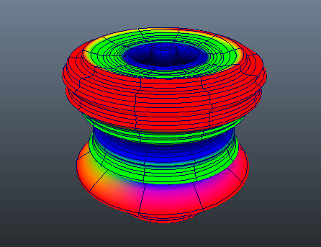 Here we "project" it on a flat plane, but it can be used for things like fracturing objects with complex topology. You can achieve the same result by simply spraying particles around. Creates sparse voxel grid around mesh geometry. 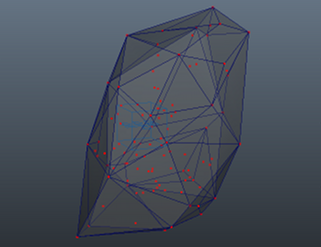 The most straightforward application of the bound node is to generate polygonal cage around any mesh geometry. 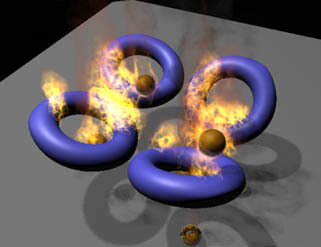 Bound nodes can be used for effortless "down-rezing" of complex objects for simulation purposes. 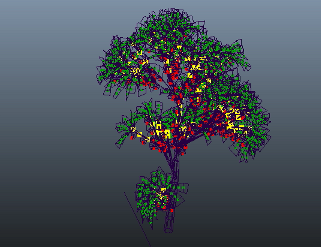 Example video 1 shows an out of the box simulation of the proxy geometry (1300 points) generated from the original tree (31000 points). Example video 2 shows simulation of the original geometry. Notice the frame rates. Converts from one component type to another. 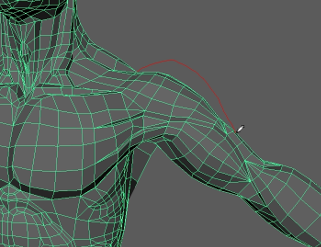 Convert vertices to edges and feed them into extrude and delete nodes. Dynamic field node that implements a curl noise funtion. 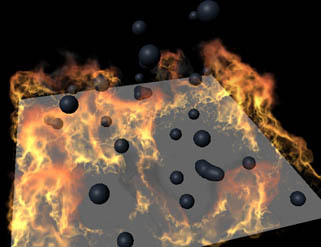 Provided are many parameters to control the behavior of the affected objects (particles, fluids, rbds, etc). CurlNoise field applied to particles. Implements a space-partitioning data structure that allows very fast searches of points and mapping of their attributes, such as (positions, colors, normals, velocities, etc). Static high-res point cloud is advected by mapping its point positions and colors to particles influenced by a curlNoise field. Use any point cloud (particles, vertices, CVs, etc) and its per-point attributes as a directional or radial field influencing dynamic objects (particles, fluids, rbds, etc). Plenty of controls are provided to allow precise control over the affected objects. 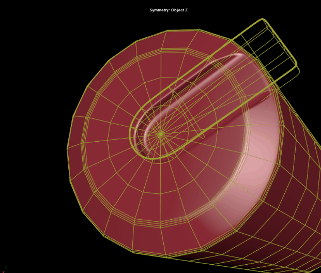 PolyCylinder is deformed by wave deformers and its position is animated. 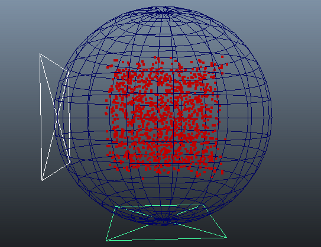 PointAttributeToArray node passes the point positions and tangents to pointCloudField node. The tangent vectors are interpreted as velocites and are applied to the particles. Second pointCloudField node attracts the particles around each mesh vertex so they do not escape when pushed by the first pointCloudField. Using pointCloudFields we can use any geometry or custom arrays to control dynamic objects in ways that are hard to achieve otherwise. This node measures how much the geometry stretches or contracts, based on different rules. 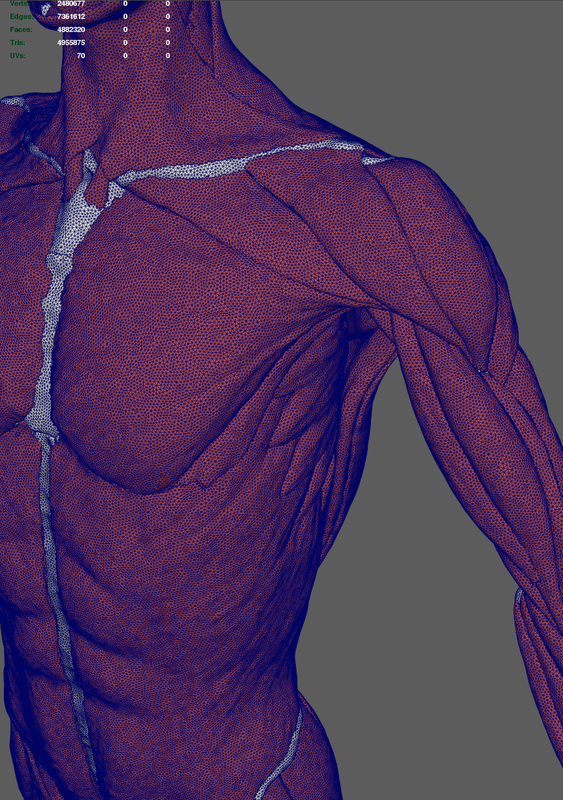 The output color map can be used to control wrinkle, muscle, veins, bloodflow and other properties that are often required for digital characters. 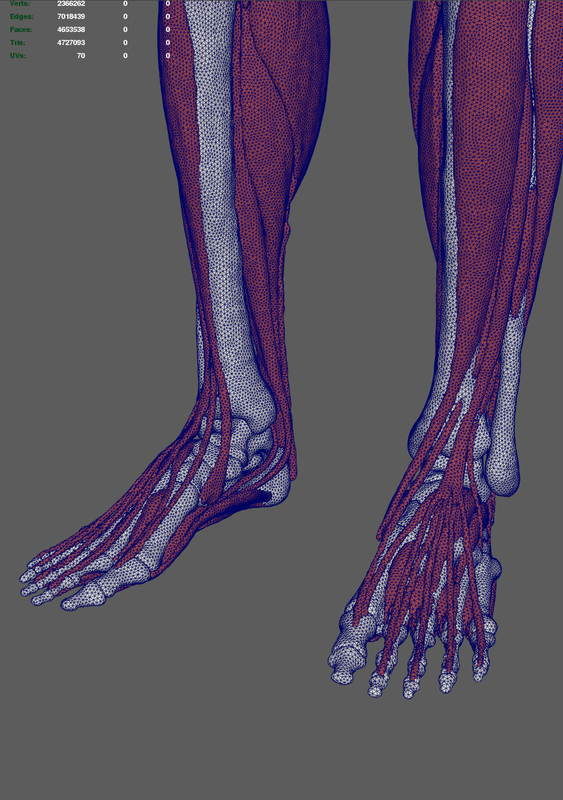 Common use case of the tensionMap node - red colors represent compression, green is neutral, blue is stretching. Efficiently manage python and mel scripts - execute, source/import, edit, tweak attributes in the UI, argument presets, save/load parametrs, etc. 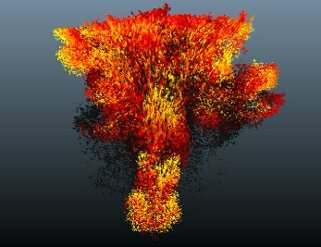 Powerful fluid emitter that can use as a source any point cloud (particles, vertices, CVs, etc). There are plenty of options that provide precise control over the emission process. Particles move through fluidContainer, pointCloudFluidEmitter reads their positions and emits fluid properties in the voxel grid. 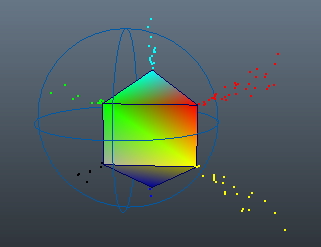 In this example only the particle positions are used, but any other attributes such as veolicity, mass, color, etc can be utilized too, if needed. In the previous example, the fluid lacked speed once emitted in the container. To improve on that, in this second version of the scene, a pointCloudField node that uses the particle positions, radii and velocities pushed the fluid in the desired direction. 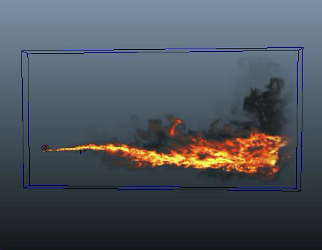 As a result the fluid looks a lot more like a flamethrower. 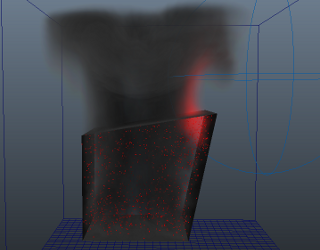 Using this node and a bit of creative thinking one can apply deformers to fluids much like any other geometry in Maya. Maps pixels to points (particles, verties, CVs, etc) and outputs the RGBA channels packed inside a double array. There is a wide arrange of applications for this data, such as texture deformers, emitters, modifiers, etc. The standard Maya texture based fluid emission is ok, but we often need more precise control over what is emitted and where. 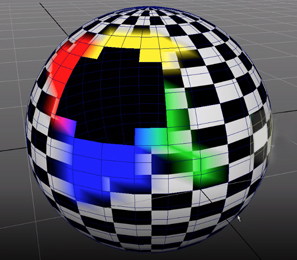 In this example textureToArray node converts animated ramp texture to point colors. 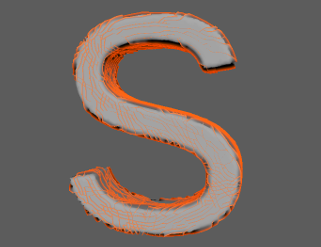 AttributeTransfer node uses boundingObject to override the texture colors in specific area of the surface. In this case we do it for colors, but it can be anything else - density, fuel, etc. 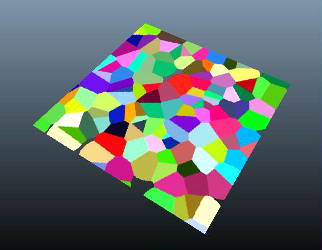 PointCloudFluidEmitter picks the final colors and emits them into the voxel grid. Precise and flexible fluid emission systems can be built using similar methods. Offsets points along their normals, velocities or custom vectors. 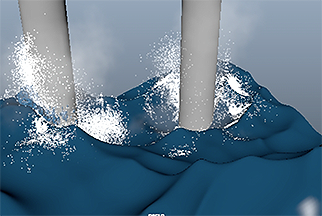 The peak deformer can do miracles on your meshed fluid sim. 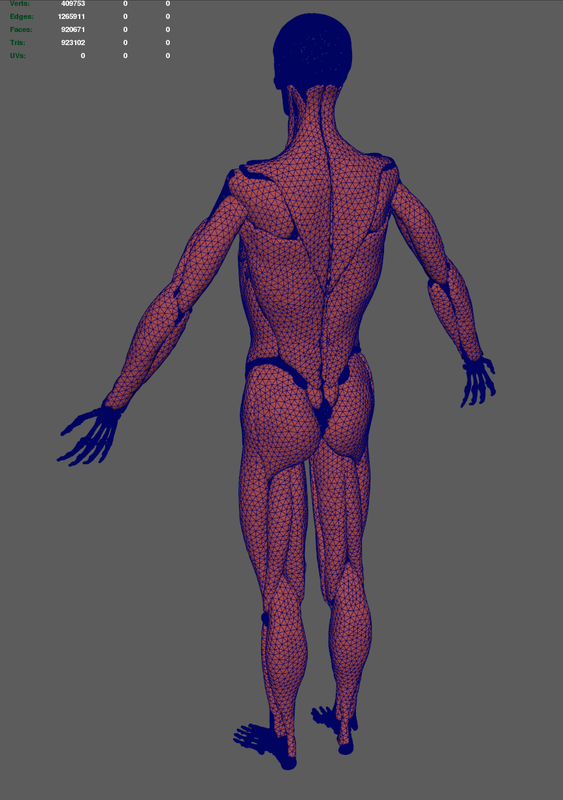 On the left side is the meshed sim, on the right side is the same geometry, but with applied peak deformer. A simpler example with exagerrated peak effect. 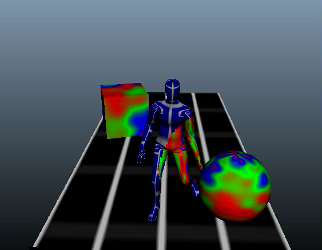 TextureToArray node converts animated ramp texture to point attributes (in this case - per-point weight), this weight data is passed to peak deformer. The peak deformer offsets points along their averaged normals. 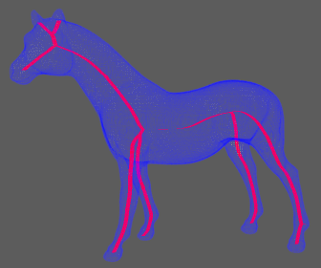 Bounding object and attributeTransfer masks out certain areas. 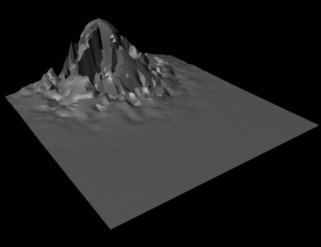 TextureToArray nomde feeds weight map extracted from a procedural noise texture into a peak deformer. 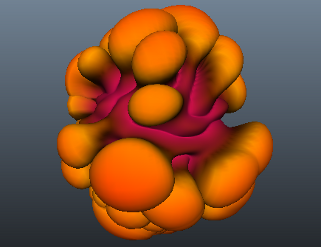 Second peak deformers makes the blobby "mushroom" effect. AttributeTransfer adds point colors. 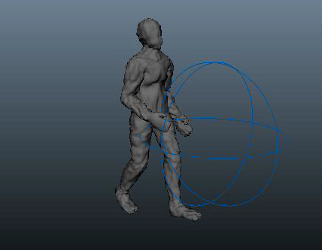 Non-destructively manipulates animation paths directly in the viewport. 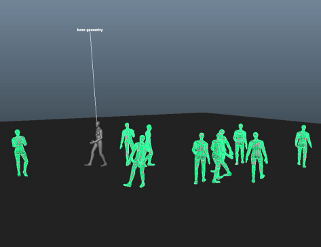 The trajectory animation system in action. Notice the additional information displayed on screen. There are multiple options that can toggle visibility of the individual components. 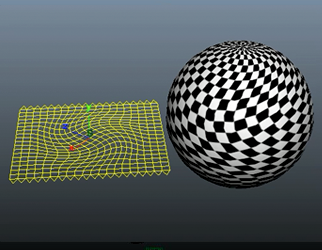 Time offset geometry (meshes, curves, surfaces, etc) by evaluating it independently from the global timeline in Maya. 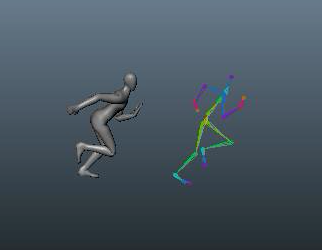 Basic example where sking clustered geometry bound to animated skeleton is time-shifted independently from the underlying skeleton motion. Extract fluid data (density, velocity, color, etc) and output it as arrays. 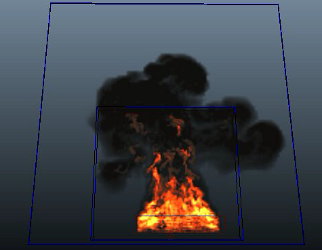 The fire component of the simulation exists in the small fluidContainer only. 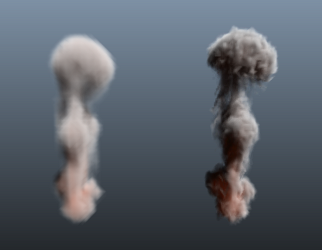 FluidAttributeToArray node extracts the voxel properties from there (in this case position + density only) and passes them to pointCloudFluidEmitter emitting smoke into the big fluidContainer. 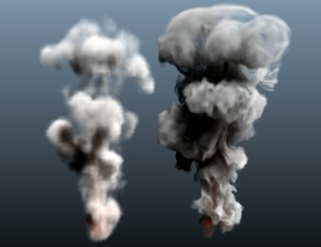 Using this technique we can split the main elements of the fluid simulation (in this case - fire and smoke) between different containers for more precise and independent control over simulation and shading. Voxelize geometry and render it as "fog". 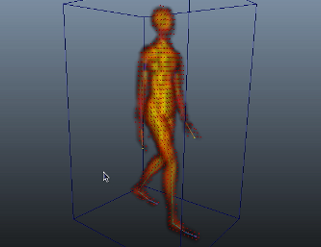 ComputeVelocity calculates the point velocities of the dancing character and passes them to a pointCloudFluidEmitter node in attributeTransfer mode. At each step the pointCloudFluidEmitter will empty-up the fluidContainer before emitting fluid properties, effectively transfering attributes from input pointCloud or geometry to the fluid. One of the most commonly used nodes in SOuP. 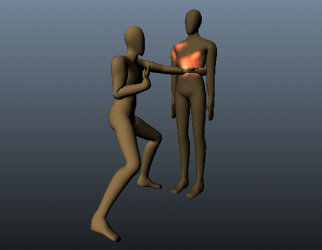 It transfers point attrbiutes between objects, based on proximity. 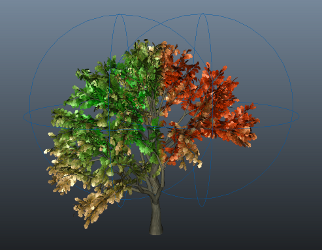 Summer and autumn leaves - transfer point colors using two bounding objects. Influence the weights of nConstraint applied to nMesh. 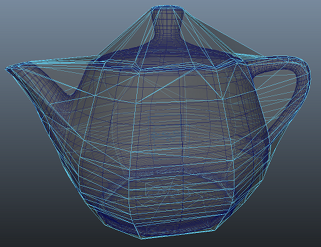 Transferring point positions from the teapot object to a larger sphere around it and merging the overlapping points of the sphere produces a convex hull geometry. 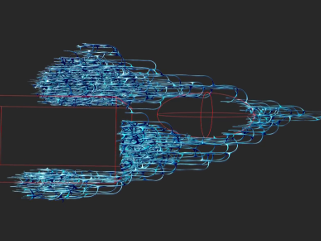 Another convex hull example, this time with animated point cloud. Similar to the attributeTransfer node it calculates weights based on point proximity in the world. The node is designed to work in conjunction with the boundingObject one. Data is conveniently packed as multi-array attributes that can directly influence the behavior of deformers. 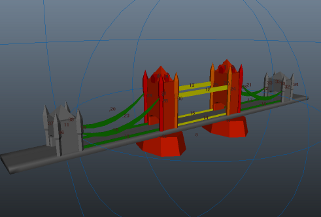 MultiAttributeTransfer feeds a cluster deformer with point weights based on proximity between character and ground geo. The closer they are - the stronger the weight is. Point radius, falloff ramps and other attributes can be controlled globally for the entire set of points or through weight maps for localized control. 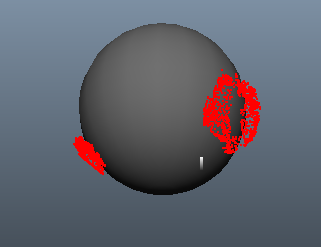 (it will do it based on point normals instead of globally for the entire object like the cluster). Similar to the example above, but in this case we "remember" the contact areas between character and ground plane. Mind, this is not the regular soft body trick - it is all procedural - no dynamic simulation involved. MultiAttributeTransfer allows for localized control over deformer weightsMaps. 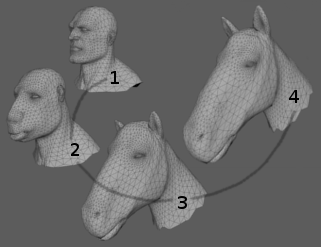 In this example we have 4 blendShape targets applied to a head geometry. Each boundingObject is connected to multiAttributeTransfer node that controls the point weights of one of the four targets. The same result can be achieved by using attributeTransfer and arrayToMulti nodes. That's why there are two example scenes supplied. 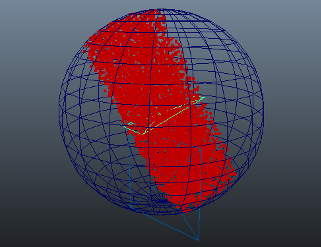 Combination of point, peak, arrayDataContainer and computeVelocity nodes can produce interesting motion based deformations. This example shows the very basic of the idea that can be easily extended to achieve much more complex and refined results. Accumulates data over time, effectively overcoming some of the inherent limitations of the DG and its evaluation mode in regards to data persistance. 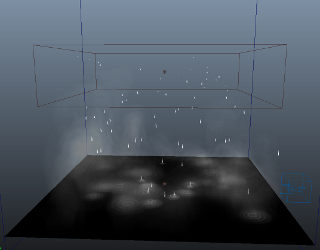 Using arrayDataContainer nodes we can create interesting effects like wetmaps or accumulated damage. 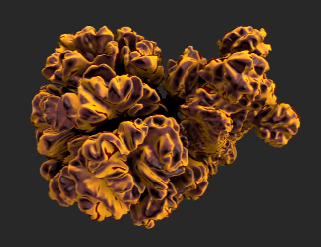 Generated data can be used to drive blendShapes and texture maps. 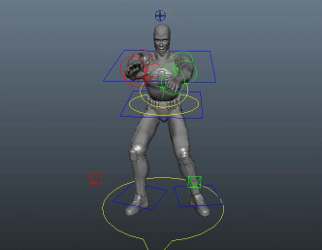 AttributeTransfer node transfers per-point weights from fighter character to the static one. This data gets passed to arrayDataContainer node and then to arrayToPointColor one. MentalRay vertexColors texture pipes it into a shading network where it is used for blending between two textures. The arrayDataContainer node can "sink" data over time. At each evaluation step it decreases the stored values, creating a disappearing "wetmap" effect. PositionPP, radiusPP, rgbPP, weightPP get transfered from particles to the water surface. As result ripples form around every particle that hits the water. Peak deformer displaces the ripple points along Y. Also pointCloudFluidEmitter emits fluid properties from the white areas of the ripples. 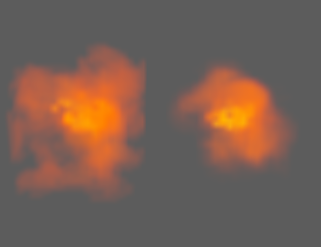 Here particles transfer weight over to the nCloth meshes via the arrayDataContainer which maintains the values over time allowing fluid emission. The pointCloudFluidEmitter gets its PositionPP from a pointAttributeToArray and the inDensityPP comes from the arrayDataContainer. Similar to the above method except the reverse is happening here with the weight transference. The emitting mesh already has a weight of one but as particles land on its surface, the contact points turn black which prevents fluid emission, hence we can "put out the fire" so to speak. 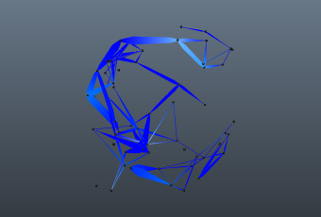 Constructs nurbs curve from point cloud, where each point becomes a curve CV. PointAttributeToArray nodes extract particle positions and map them to the idIndex arrays. 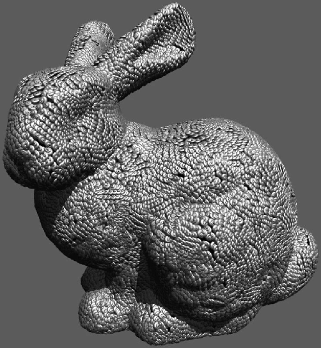 PointCloudToCurve nodes get this data and create nurbsCurves. 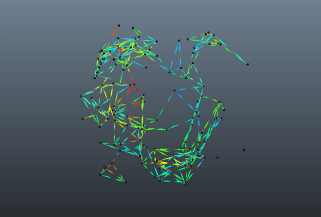 Loft node creates polygonal surface, attributeTransfer maps the particle colors to the polySurface (optionally we can transfer and velocity for proper motion blur). Ramp controls the opacity of the surface along its length. Creates multiple curves from properly indexed point cloud. Live "garbage collection", etc. 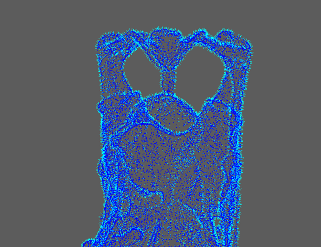 This image is produced by parentID attribute of emitted particles partitioniing the point cloud. Data is passed to pointCloudToMultiCurve node that generates multiple nurbs curves forming "trails" from the subsets of points. 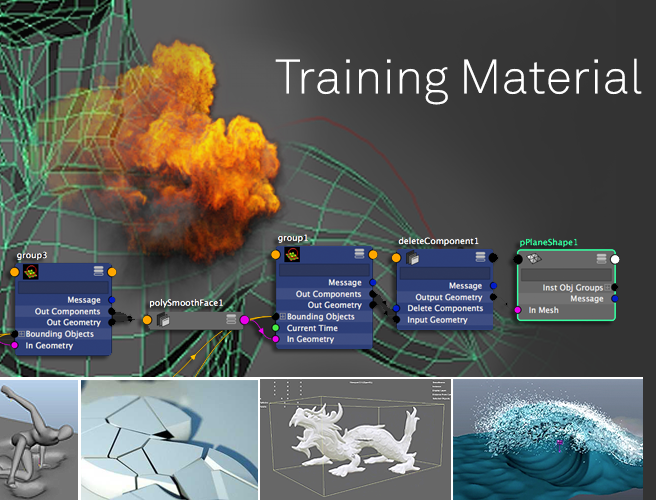 Maya's geometry instancer relies on specific data structure that is great in many ways and useful for many other things too. Unfortunatelly, it is implemented as a black box. This node opens it up and provides everything needed to control the instancing and/or pack/unpack arbitrary data inside it. This approach completely proceduralizes the workflow which makes a huge difference, compared to the traditional approach of instancing to particles only. 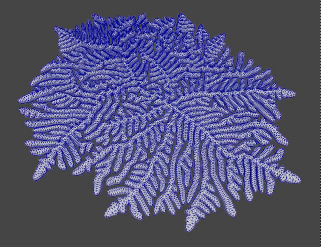 The birdman example shows a procedural instancing of feathers. 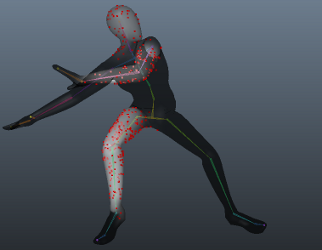 Scatter node generates points randomly placed on the character's body. 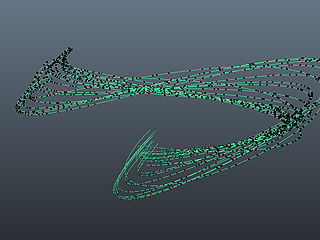 AttributeTransfer nodes adjust the feathers orientation to match the underlying surface. Data gets packed and passed to the instancer by the arrayToDynArrays node. If the voxel is empty (density = 0) the related instace gets hidden for better performance. 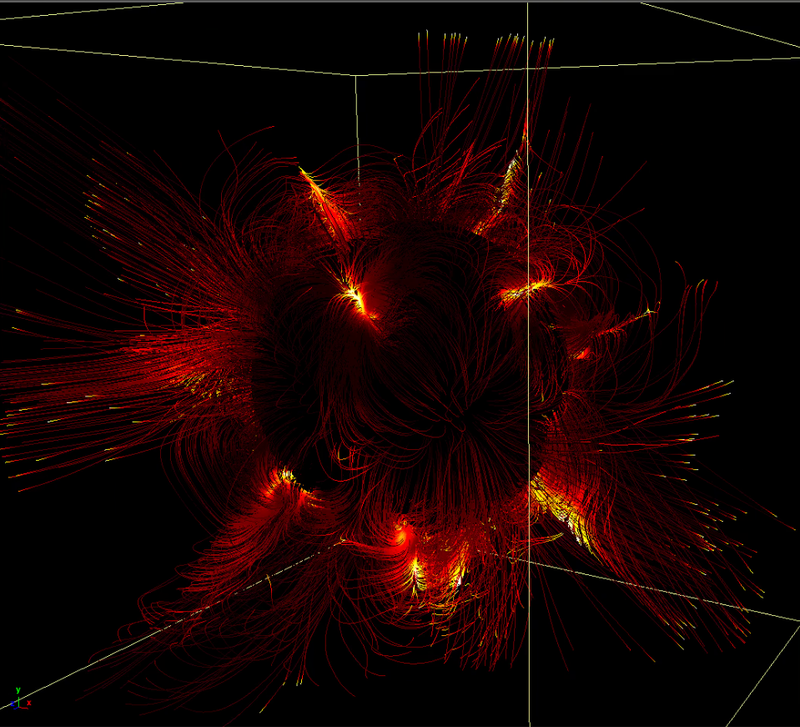 This time using 3D fluidContainer and instancing of multiple objects. If you check the example scene, pay attention to how the multiple instances get randomized using fractal texture and textureToArray node. Instancing made easy! 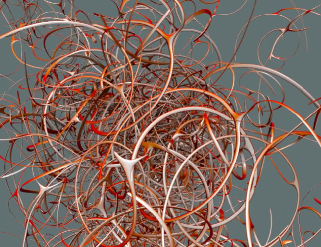 SOuP provides powerful tools for geometry instancing but the workflow is demanding. 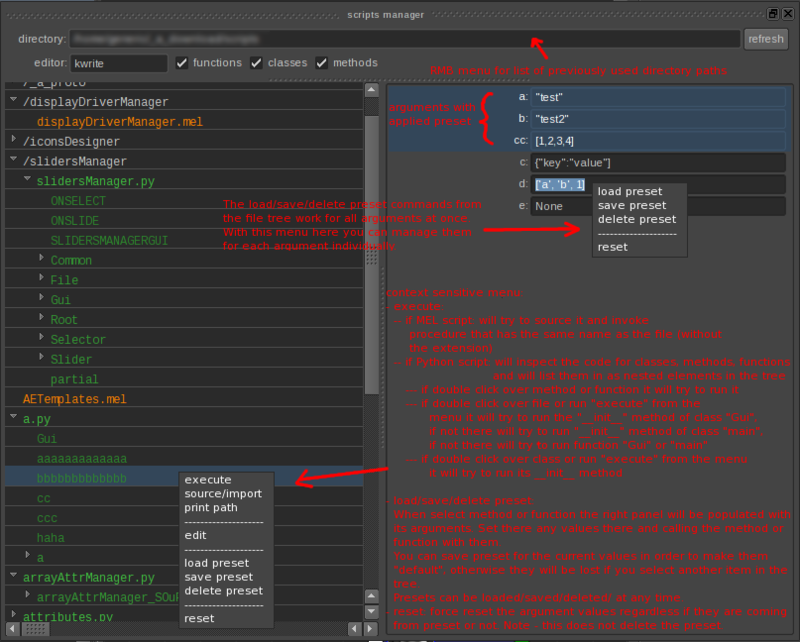 InstanceManager wraps it all in a simple GUI and straightforward workflow. Beautiful environment created by Jun Eun Kim. Extensive video tutorial covering most aspects of the instance manager GUI. Many new features have been added to the toolkit after this tutorial went online. They are described in the related SOuP release announcements on the community forums. Stacked instancing is a powerful capability of the toolkit. This functionality is covered in the last part of the video tutorial above. 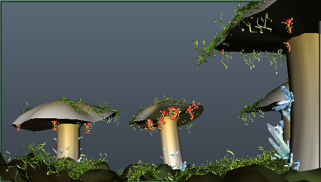 There green moss and red alien plants get instanced on mushrooms instanced on the terrain surface. 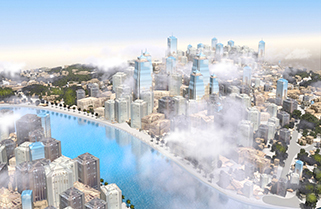 No instancing system is complete without proving that it can make a city. A standalone node that seamlessly integrates Python scripting into the Maya DG and its evaluation model. Local variables provide parity with input and output attributes. 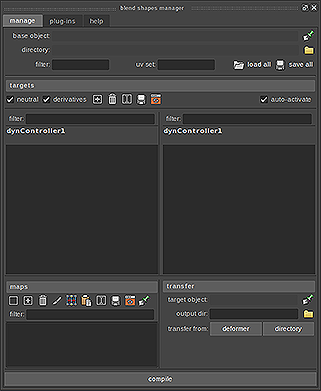 AE template contains Python console and extensive set of controls that enable handling of large number of objects with ease. 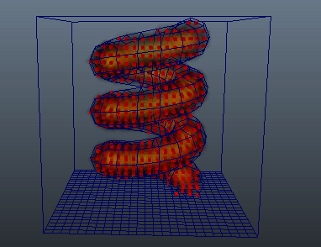 example video 4 The 4 example videos showcase programmed and procedural manipulation of transform objects and mesh geometry using Python code encapsulated inside the pyExpression node. There is a simple way to turn any particle shape into a point cloud container reacting on input events. Here one particle shape influences the size of another one. Transfer point colors from geometry to particles. 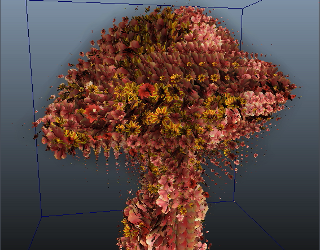 Remember how hard it was to make particles react on surface properties from surrounding them geometry. Well, not anymore. AttributeTransfer node influences the radius of particles passing through boundingObject. PfxToon color transfer to particles. Nucleus lacks one very useful feature we enjoyed in the old rigid body solver - collision detection. SOuP brings it back. 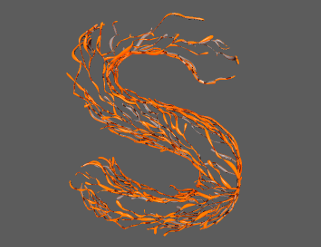 - notice how the particle colors always match the animated texture of the surface underneath. Drive transform nodes, or procedural networks with data from audio files (wav, aiff, aifc, snd, stk). Particles, fluids, geometry generation or deformation, etc. - all they can benefit from this versatille node. 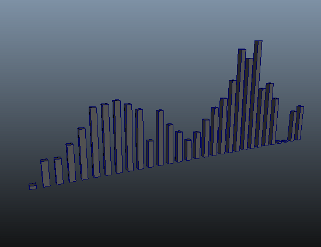 Interpolate nurbs curve through the audio bands, feed the result into a peak deformer that offsets the points of the curve. Revolve a nurbs surface to visualize in 3D. Audio bands represented as scaling transforms. Deform polygonal sphere with audio data. 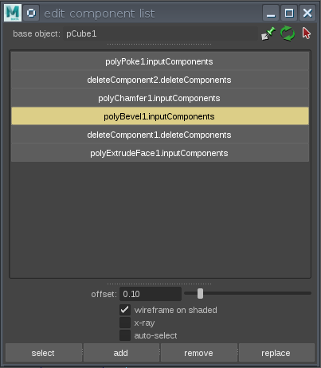 Colorize vertices according to amplitude. These two nodes provide the ultimate control over UVs. Convert them to mesh geometry, apply deformers, animate, sculpt by hand, or manipulate them procedurally, then convert the result back to UVs. 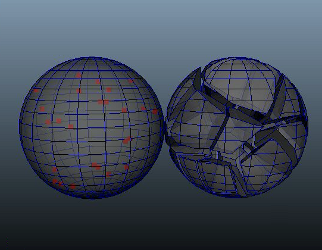 Sphere's UVs are converted to mesh geometry (the yellow plane). Soft modifier is applied to it and rotated to produce twisting effect. 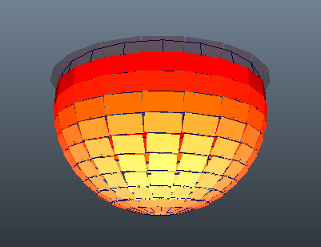 As a second step the plane vertices are interpreted as UVs and applied back to the sphere. Notice how the applied checker texture reacts accordingly. 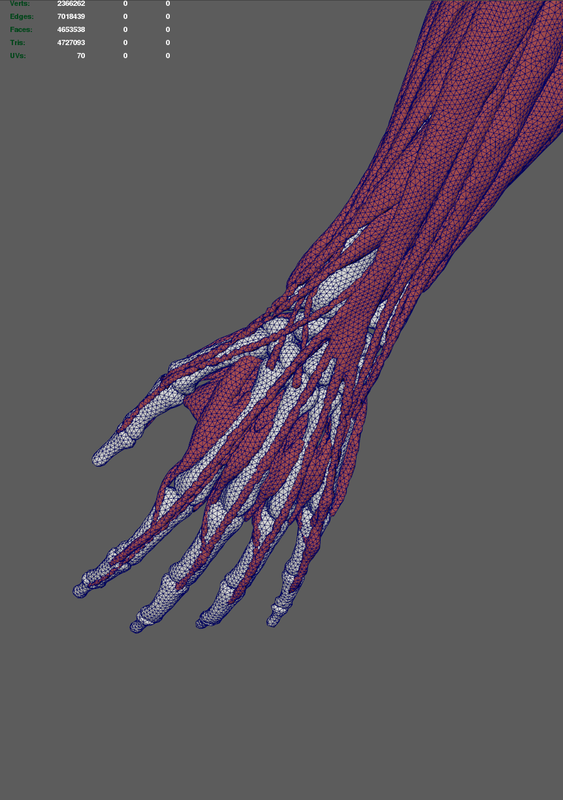 Converts (UV maps) array data to 2D texture that can be plugged directly into any shading network. 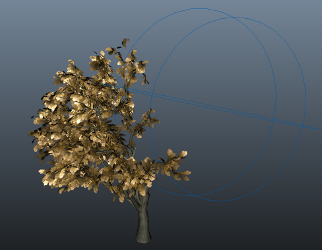 With this node we can directly influence shaders by geometry level changes in the scene. 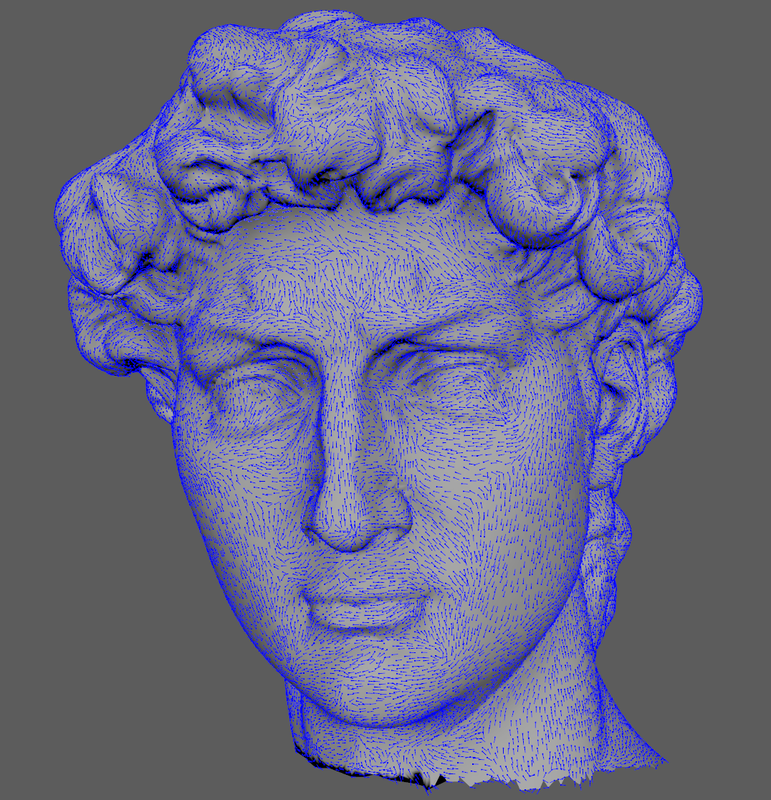 AttributeTransfer+boundingObject generate point weight map. 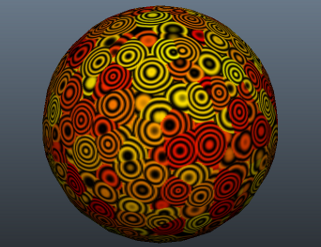 ArrayToTexture2D converts it to texture modulating a procedural noise applied to the displacement channel of the shader. This node can use any point cloud (particles, vertices, CVs, vector array, etc) as an emission source. It directly propagates rate, position, velocity, mass, lifespan, radius, rotation, color, opacity, 5 user scalar and 5 user vector attributes - all inherited from the input point cloud data. There are plenty of parameters that control the emission behavior. 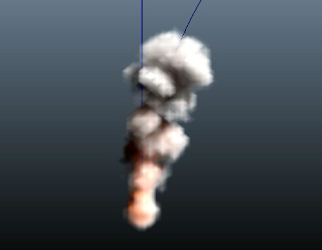 Control particle emission using bounding object. 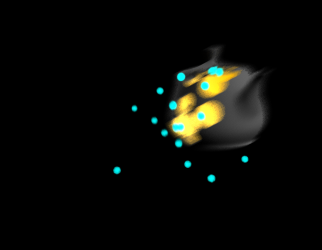 Vertex normals are used as velocity vectors for the new particles. Particles inherit the vertex colors. 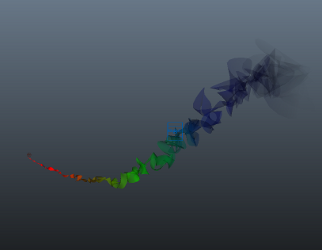 Particle emission from mesh surface with color inheritance. 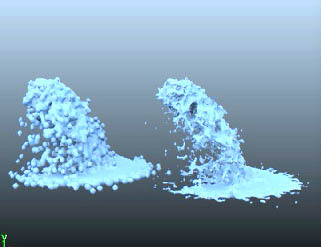 Emit particles from fluid voxel grid. Particles inherit voxel velocities. Voxel densities controls emission rate. Voxel densities are piped to the particles as userScalar1PP attribute that controls ramp attached to the rgbPP attribute - that way we recolor particles according to the densities. Making force shield effects is now trivial. Easily create and manager large number of animation sliders and selectors. These objects can be used to control any element or group of elements in your scene. 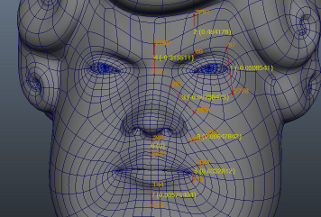 Facial animators often use similar tools to streamline their workflow. This tool adds lots of additional features and flexibility. For more information read the help tab. 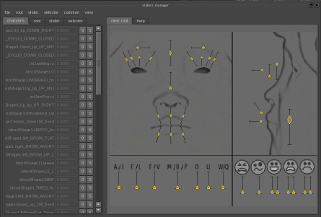 Example setup for simple facial rig. Included is a "takes" system that allows artists to capture "snapshots" of all/selected sliders and apply them back partially or fully. 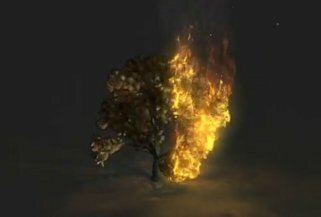 zSpheres implementation in Maya. Credit goes to Michael Tuttle for sharing his prototype, based on Justin Ardini's open source project (http://justinardini.com/), which became the basis of this work. Source code is included in the downloadable SOuP archive. Video tutorial outlining the main concepts and basic workflow. 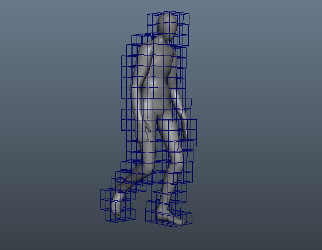 The bmesh system can be useful in many cases, such as making of low-res proxy geometry for animation, or dynamic colliders, as well as a starting point for character modelling. 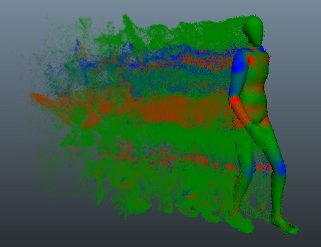 Combining point cloud FX emission with peak deformer and Maya's standard cluster, ideal for hero wave FX, can be achieved at the fraction of the time it takes to run a bifrost simulation. 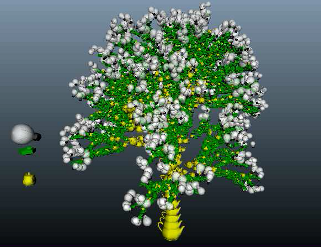 Similar to the example on the left, except now SOuP nodes are used to immitate mesh collisions. 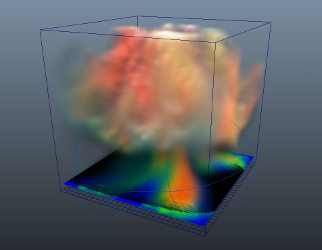 In addition, the pointCloudField uses a subset of mesh points to drive the particle/fluid emissions along the vertex velocities of the wave mesh. The particles then have the luxury of resting on the ocean surface when not in range of the pointCloudField. Interesting example combining group and delete nodes controlling particle and fluid emission, by Jeremy Raven. 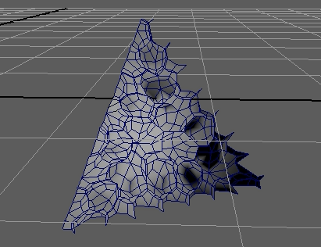 Multiple mesh shells within a single mesh object get controlled by procedurally animated points. 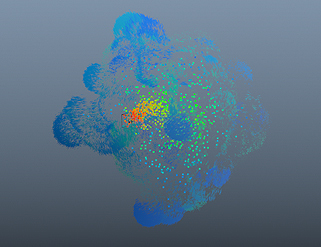 Each point of the point cloud controls position, scale and color of a corresponding shell. Draw connections between points based on their proximity. 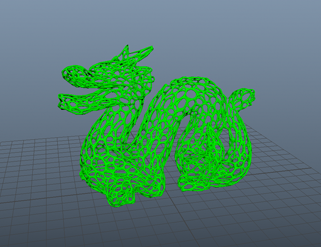 Links can be represented as openGL lines in the viewport, instanced geometry, or live editable mesh. Extensive set of controls provide complete control over all aspects of the link's appearance, such as color, opacity, thickness, curvature, etc. Create dashed lines by varying the links thickness along their length. 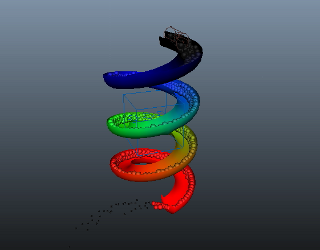 Basic example showing color inheritance from the input point cloud and blending the colors along the links length. Applied "gravity" changes the shape of the links between their start and end points. Blend between different targets based on surface tension. Workflow is as simple as it gets. The provided example video shows how the node reacts to manual user input from soft-selection. Behavior is the same when the geometry is animated by deformers, or other procedural methos. 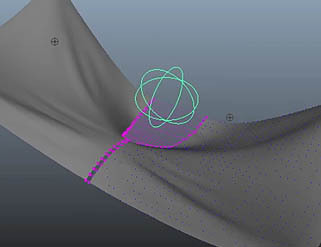 A generic node that can directly controls wire deformer(s), or individual nurbs curves. It can be used for many things, but the most common case is "sticky lips". 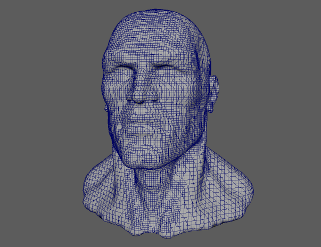 Basic "sticky lips" deformation effect. Many "sticky lips" setups often end-up being a buzzy network of nodes, constraints, expressions, deformers, etc. Our solution simplifies everything to just one node that takes care of all involved complexities. As a result, technical artists have one thing less to worry about and the DG performance gets significantly better. 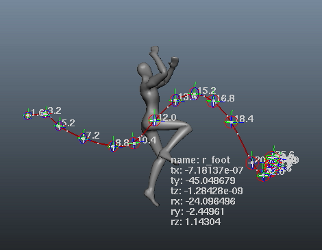 Simple Python API allows an easy integration into any scripted rigging systems. Included is GUI that streamlines the interactive workflow. Similar to the tensionMap node, but in this case tension is calculated for user defined pairs of points only. Each tension value can be remapped by corresponding ramp. Included are additional options for min/max limits, absolute values, etc. The most common use case is to control pre-made ramps, carefully crafted weight / wrinkle / bloodflow maps and shaders, as well as other nodes and deformers. 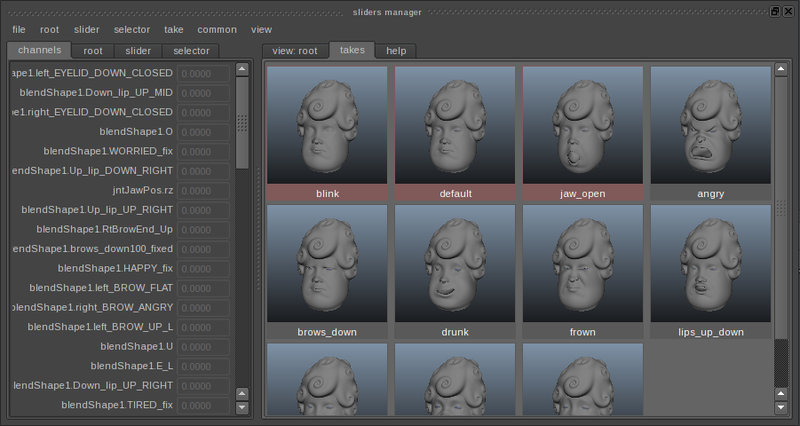 Artists familiar with comprehensive facial setups will appreciate the capabilities this node brings to the table. 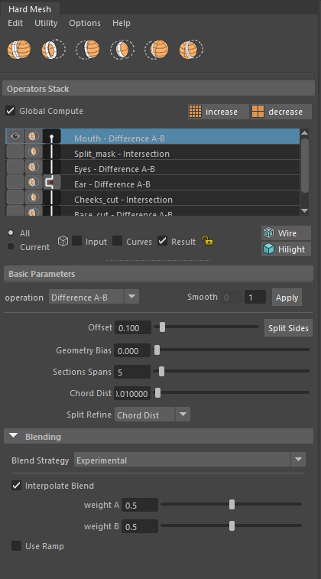 The provided screenshot shows a face rig with multiple tension pairs that will drive manually painted weight masks splitting extracted wrinkle map (from high-res sculpt) as individual regions that react to the animated face deformations. 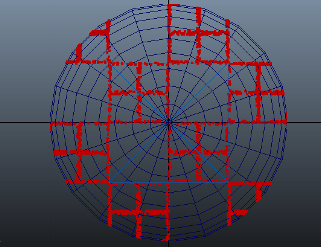 Creates dense/uniform voxel grid around mesh object. In combination with pointsOnMeshInfo the voxel grid can be sparsed. With other words - voxels located further away from the mesh object's surface than given distance threshold get discarded. 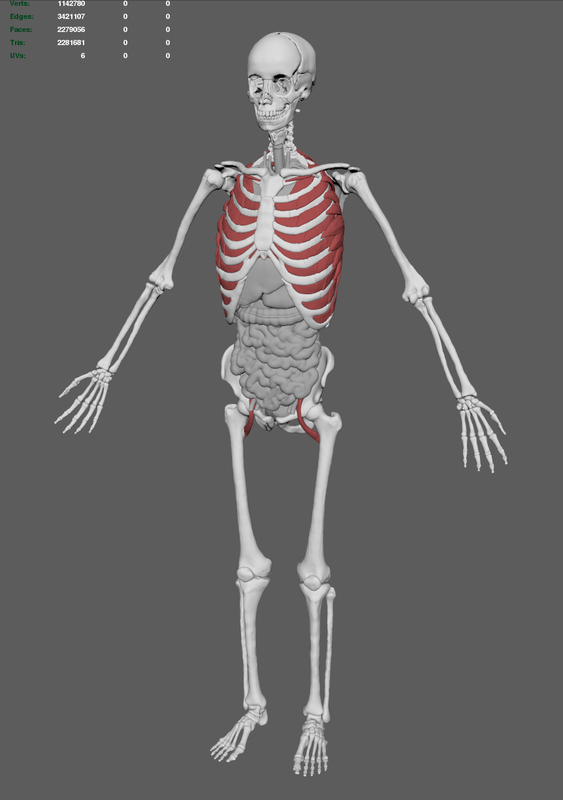 The remaining voxels can inherit normals, colors, UVs, and other properties from the underlying mesh geometry. example video 2 Multiple capabilities of the voxelGrid in conjunction with other SOuP nodes. Powerful and versatile node that copy-stamps mesh geometry onto the points of a point cloud (vector array, particles, vertices, CVs, etc). It supports per-instance time offset, control over vertex colors, UVs, soft/hard edges, shader attachments, normals, scale, etc. 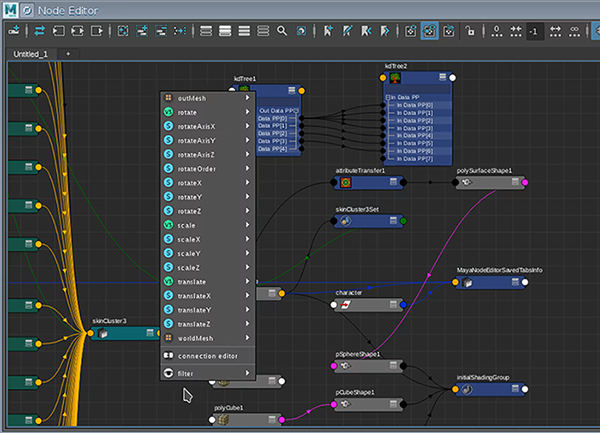 A key feature is the ability to override any node.attribute from the upstream graph of the input mesh objects. Output can be a single editable mesh object, or instanced geometry, or both. 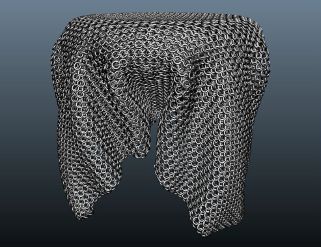 Turning any mesh geometry into a chainmal, knitted fabric, etc, is now trivial. 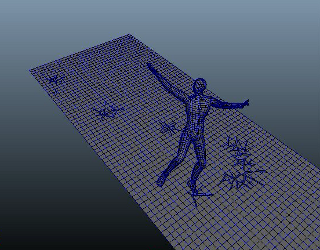 Simple crowd simulation - single character rig with walk animation cycle is instanced with time-shift onto points sliding on mesh surface. 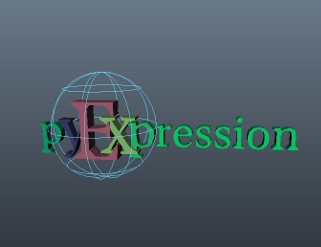 Basic motion graphics element. Video tutorial outlining the basic workflow and main concepts of the copier node. Very useful node provided by Alex Smolenchuk. 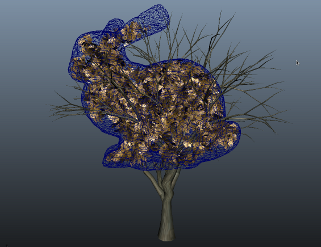 It performs uniform scattering of points on mesh objects. 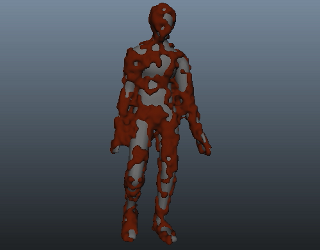 The generated point cloud can inherit normals, colors, UVs, etc properties from the underlying surface. Shape the silhouette of mesh objects in camera space using intuitive and effortless workflow. The brush interface in action. 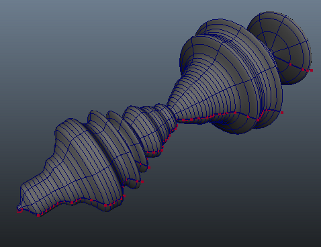 A powerful deformer and based on in toolset for geometry collisions. 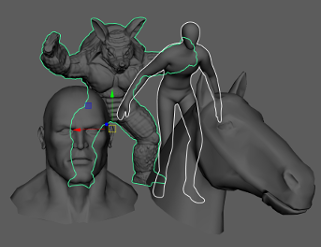 One-to-one comparision between Maya's sculpt deformer, Maya Muscle and SOuP's collide. Result is self-explanatory. Basic example produced by using the bulge functionality of the collide deformer. 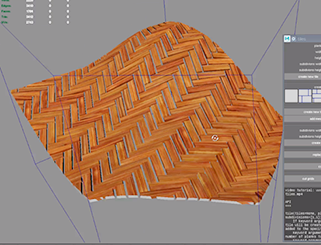 Generates organic patterns on the surface, or inside the volume of a mesh object. Highly efficient, comprehensive and flexible connection editor that significantly improves on how artists work with nodes, connections and more. This video tutorial shows the base workflow. 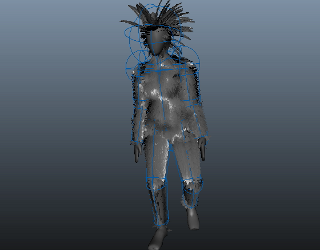 Finds and constructs the shortest path between mesh vertices. video tutorial - workflow and interactive toolset. Quickly and effortlesly create and modify tiled geometry. This toolset provides all the bells and whistles for dealing with tiles - fully procedural, decoupled tiles from grids, randomize position/rotation/UVs, conform to a non-flat walls, "cutters", Python API, etc,. Powerful solver and flexible toolset built around it provide us with the ability to deform any given mesh to closely approximate (fit) the input geometry, regardless of their topology. Uniform growth. video tutorial - main concepts and basic workflow. 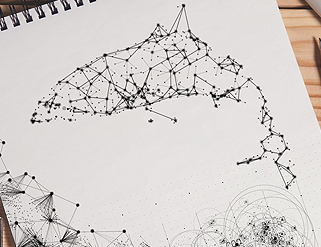 Iterate on just any data set and accumulate the results over multiple evaluation steps of the dependency graph. Solver + group + extrude. 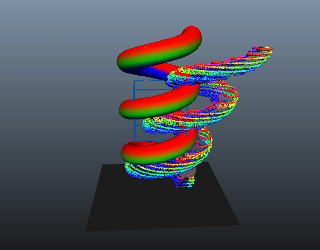 Solver + goup + extrude + colliders. Solver + resample + resolvePointCollisions. Organic growth achieved on an arbitrary mesh surface. Peter Larson shared here some of his tests with the solver node. Simple, yet very powerful tool for hard-surface modeling. Provides the ability to adjust the affected components (vertices, edges, faces, CVs, etc) of the applied geometry modifiers at any stage of the modeling process. Think about it as a hands-on-procedural modeling workflow. Video tutorial outlining the main concepts and common workflow. 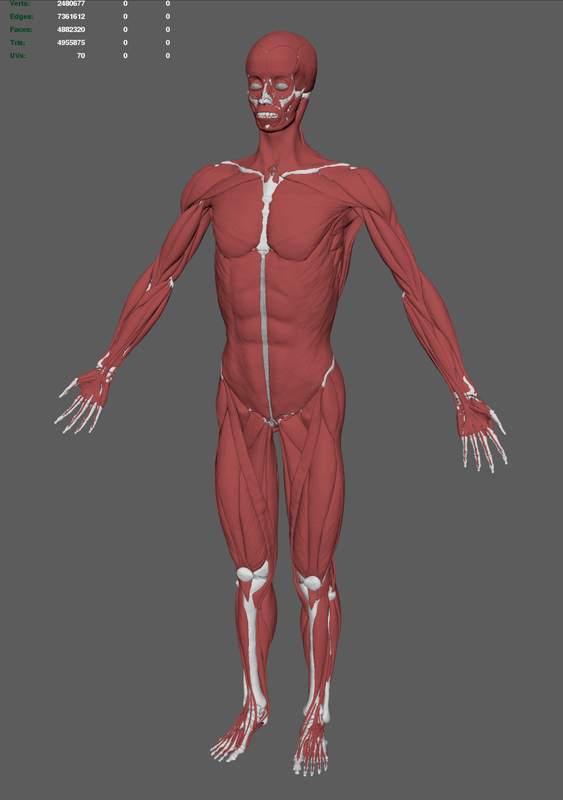 Included in the "scenes" downloadable archive is a complete high-quality human anatomy asset with multiple LODs, that can be used as a starting point for muscle simulations, reference, etc. Credit goes to Database Center for Life Science Research Organization of Information and Systems. 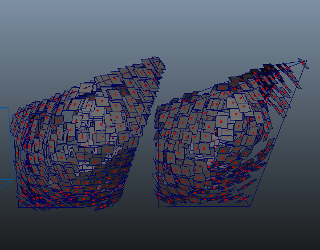 These two nodes estimate the local differential quantities of mesh surfaces and point clouds. Generated data can be used to control instances, hair, dynamic effects, etc. 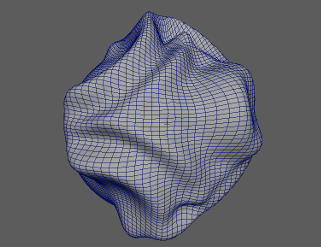 Surface flow calculated for arbitrary mesh object. 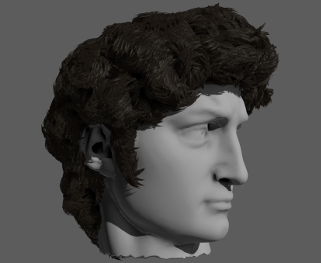 Surface flow vectors used for procedural hair grooming. Scales and feathers that behave nicely and don't flip. Monet painting like effect created using the surface flow vectors. 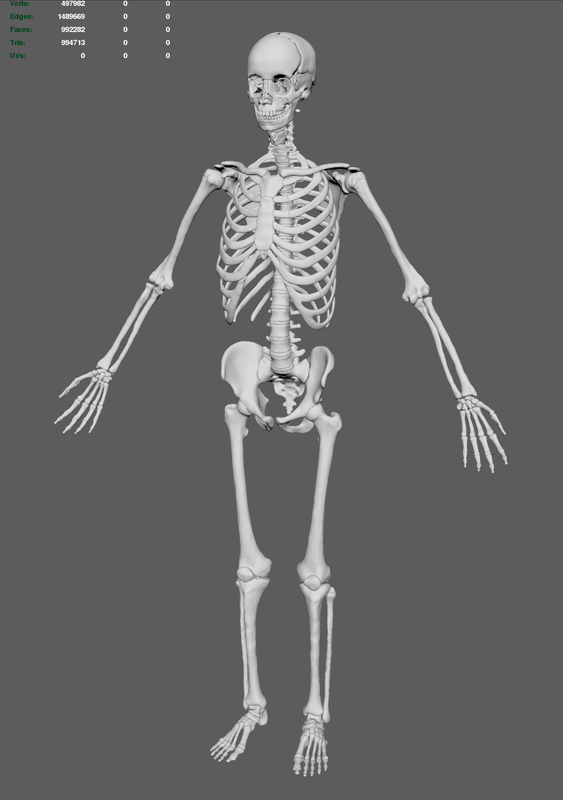 Procedural generation of skeletons from arbitrary geometry. 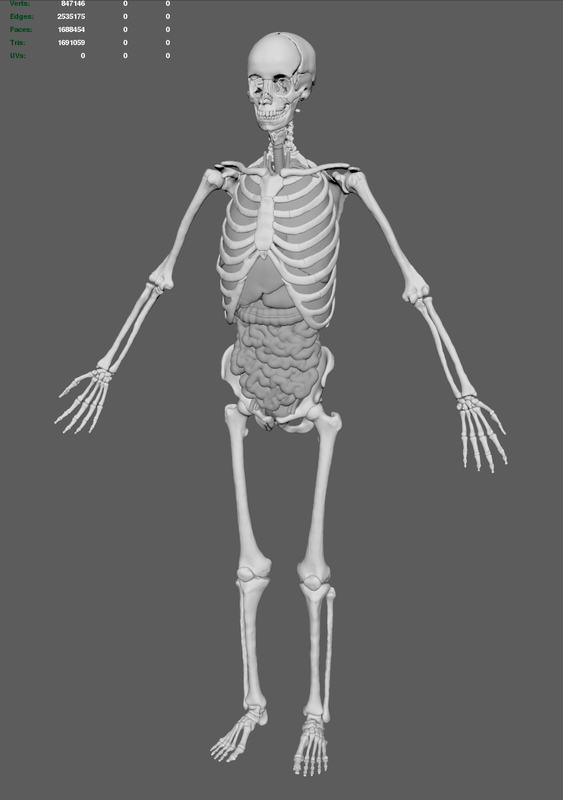 Skeleton mesh created from arbitrary mesh object. An alternative viewport selection feedback system that is easier to work with in many cases compared to the standard one. Generates constrainted, or conforming tetrahedralization, cellularization, triangulation, convex hull, tessellation of arbitrary mesh geometry, or point cloud. 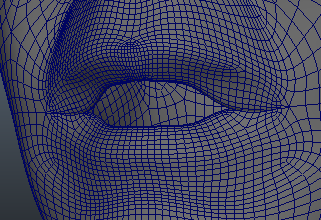 Geometry reconstruction of arbitrary mesh geometry, oriented and unoriented point clouds. 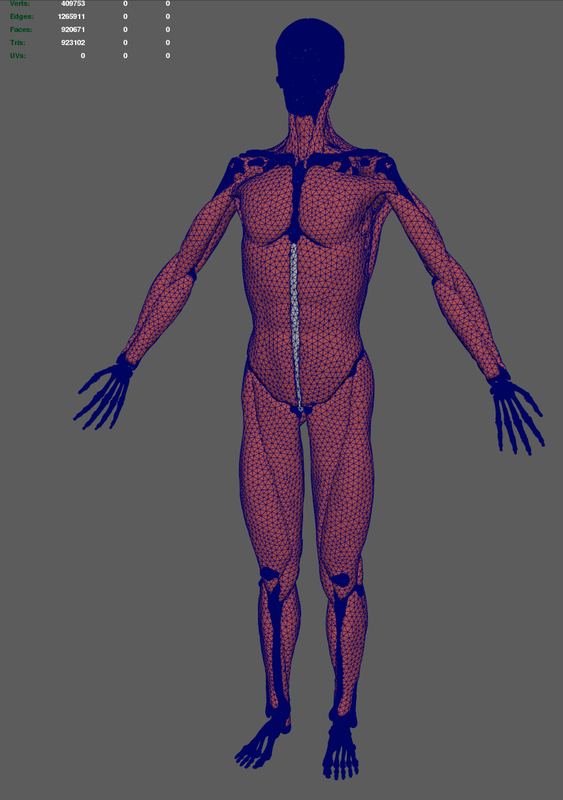 Morph between arbitrary mesh objects. 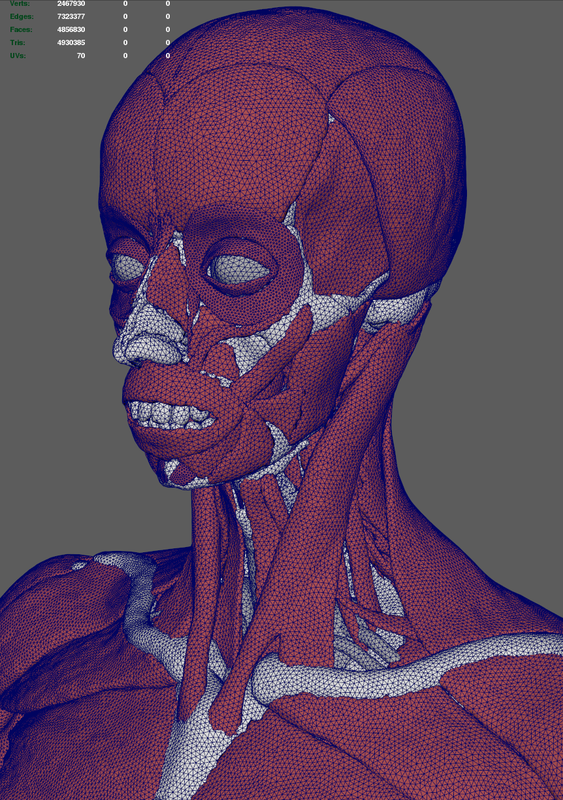 Prepare high-rez mesh scans for rigging and/or simulation, by remeshing them to optimal topology. Graphic examples by Firas Ershead. Represent camera frustum with mesh geometry. Clip scene objects with the frustum geo.